Xochimilco is a city within Mexico City with a particular scenario and mixture of actors that makes it unique. The vibe feels different there, like if anything could happen at any minute. 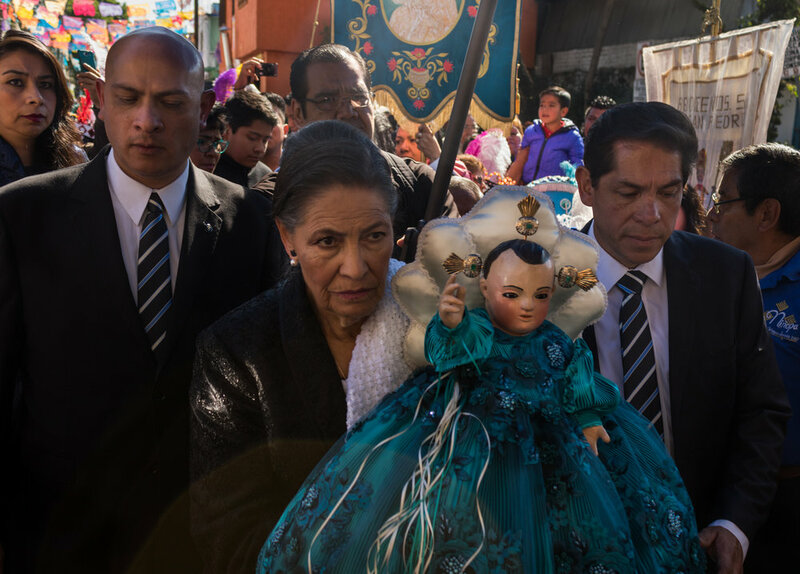 The Niñopa, a 300 year old doll deity, synchretic symbol between catholic and xochimilcan roots, holds a power there that seems to bring the comunity together in an intense celebration that repeats every year, in which a different familiy receives and takes care of the Niñopa for a whole year. This is a first approach to this tradition. No se puede contar la historia de 120 millones de personas. Lo único que puedo es mostrar fragmentos, brevísimos momentos de suspenso...Una simple mirada callejera, que aunque ficticia y superficial, pretende hablar de una realidad profunda en la cual la violencia, la muerte y la religión están siempre latentes. I studied communication sciences, specialized in journalism. I ve been 8 years developing my photography as an artistic medium of expression. I’ve learned mostly in the streets, books, and from many photographs, masters and colleagues.